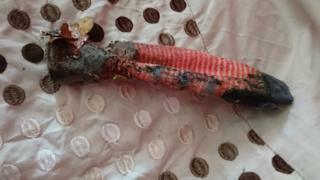 A family has been left “quite mortified” after calling the RSPCA out to deal with a rare lizard that turned out to be a dirty sock. 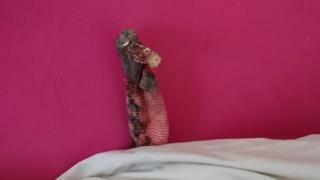 An RSPCA officer was called to an address in Coventry by the family, scared by a “lizard” under the bed. The officer, Vic Hurr, said she approached the unmoving reptile “cautiously” at the house on Goring Road, unable to identify its breed. On closer inspection, Ms Hurr realised it was not a lizard, but a dirty sock. “It was around seven inches long and about two inches wide,” Ms Hurr said. “It was protruding from the edge of the bed and it wasn’t moving at all. An RSPCA spokesperson said the family was “quite mortified” at having called the service to the rescue. Reality Check: Is there a British rush on EU passports?